ASO NATURE LAND - Professional outdoor shop. 2018.12.27(Thu) ~ 2019.1.3(Thu) No buisiness. Professional outdoor shop, Aso Nature Land, is established 15years ago. 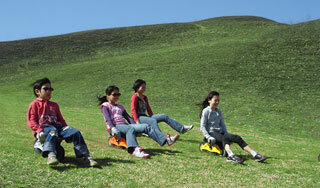 We organize fun outdoor activities in the stunning field of Aso. This is the place you can have a fun adventure you would never forget. You should check out what we can do for you!! 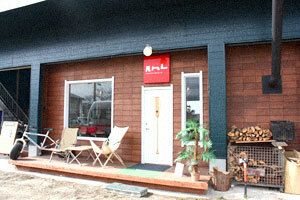 It`s just 5 min away from JR Aso station by taxi. We assist you to explore another would of adventure. All activities need to be reserved in advance.Please call or e-mail for reservation. All activities will be closed as soon as they reached to the fixed numer. All reservation must be cancelled or changed by 5:00pm the day before reservation date. Please call us or e-mail us. If you fail to do so, you will be charged a full amount of your activities. 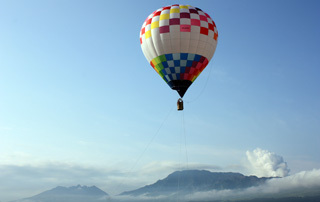 A tethered hot air balloon ascends up to about 40 meters. Once airborne, the crisp morning scenery you overlook becomes even more spectacular and breathtaking. Feel free to ask the pilot for an experience of the burner operation! Fire up the burner yourself and feel the blasting sound for real with your entire body. That's an amazing experience you'll never forget! This activity is conducted only in the early morning (approx. 5:30-7:30 am) to take advantage of the calm air, requiring you to book by 17:00 the day before. ・We will cancel the operation if the total number of reservations does not reach 10 people by the booking deadline the day before. ・In case of rain or wind velocity of 3m/s or more, the operation will be canceled. Bockerl is an innovative sport gear you can have a whole new experience with. Without trying it, you cannot even imagine the kind of fun the ride brings to you. It's so versatile you can choose to go down the hill leisurely or swoop down and catch some exhilarating speed. As you pick up the technique, it's so easy to slalom by leveraging the speed. It's simple and easy but it has a lot to explore. You can choose to ride Bockerl while your friend(s) flying with paraglider, as both activities take place on slopes of the same hill. Instructions can be provided to beginners. It's suitable for everyone from elementary school students to adults. Mountainboard was developed in the US by snow boarders who wanted to extend the season all year round. And to further extend the play field to the flat terrain, motorized mountainboard was derived by installing an engine to the mountainboard. Powered by engine, the ride is full of excitement. It's stable thanks to thick tires and adjustable in speed depending on your skill. Everyone from children to adults can enjoy the ride.